The puzzle piece is the most commonly recognized symbol for autism awareness. But many people are unaware of it’s ableist history. On World Autism Awareness Day (April 2nd) , many neurotypical people show support and spread “autism awareness” for their autistic family members and friends by displaying the puzzle piece ribbon, wearing puzzle piece pins, and put puzzle piece stickers and decals on their car bumpers and windows. But one question is commonly forgotten; what do autistic people themselves think of the puzzle piece symbol? While there are some autistic people who may identify with the puzzle piece, a large majority of autistic people don’t. Not only was the puzzle piece symbol used without input from the autistic community, but it has been used to stigmatize and dehumanize autistic people for decades, and continues to be used in this manner today. Despite overwhelming opposition for the puzzle piece symbol by autistic people, it remains the most commonly used and recognized symbol for autism. The origin of the puzzle piece symbol for autism came from the United Kingdom organization, the National Autistic Society in 1963. It was created by Gerald Gasson, a board member for the National Autistic Society. He and the rest of the board believed that autistic people suffered from a “puzzling” condition, so they adopted a logo of a puzzle piece with a weeping child, displaying the notion that autism is a tragedy that children suffer from. This visualization of autism has led to decades of autistic people receiving unwanted treatments and therapies to treat a disease that they don’t have. In 1999, the Autism Society of America created the puzzle piece ribbon as a symbol of autism awareness. The Autism Society stated that, “The puzzle piece pattern reflects the complexity of the autism spectrum. The different colors and shapes represent the diversity of the people and families living with the condition. The brightness of the ribbon signals hope – hope that through increased awareness of autism, and through early intervention and access to appropriate services/supports, people with autism will lead full lives able to interact with the world on their own terms.” But hope in this context, through “increased awareness of autism, and through early intervention,” usually means through increased research of cures and treatments for autism, and through early interventions, such as Applied Behavioral Analysis, that seek to “correct” autistic behaviors by forcing autistic people to mask their autism. Today, the most recognized use of the puzzle piece is through the organization, Autism Speaks, who popularized the symbol. Since the organization was founded in 2005, they have used the puzzle piece logo to spread autism awareness. Even today, the puzzle piece logo of Autism Speaks can be seen on it’s website, in advertisements and public service announcements, on T-shirts, on pins NBA coaches wear in April, and in their Autism Walks. Autism Speaks said in a statement that, “The blue Autism Speaks puzzle piece has had a huge influence on raising awareness of autism around the world, which is why we believe it is still a worthy and effective logo. It represents the search for answers that will lead to greater understanding and acceptance of people on the autism spectrum, their diverse challenges, abilities and strengths.” The “search for answers” that Autism Speaks refers to is the search for cures and treatments. Autism Speaks has previously called autism a disease, and has said statements such as, “This disease has taken our children away. It’s time to get them back,” and have called autistic people “burdens” and “tragedies,” and has called autism itself an “epidemic.” In their“I am Autism” advertisement, Autism Speaks made statements such as that autism “robs children of their dreams,” and that autistic children “live behind a wall.” The puzzle piece is also blue, a color chosen because males receive more formal diagnoses of females, which implies that autism only appears in males or that males are “more autistic” than females are. Autistic people reject the puzzle piece symbol for multiple reasons, but the main reasons are that it is infantilizing, it promotes the mentality that autistic people are incomplete or are missing puzzle pieces, and it treats autism as a disease that needs to be “treated” or “cured.” The primary colors of the autism awareness ribbon supports the misconception that autism is something that only appears in childhood, and autistic adults are largely ignored in the conversation about autism. The puzzle piece symbol carries mantras such as, “Until all the pieces fit,” or “Until the puzzle is complete,” which translates to until there is an answer, treatment, or cure for autism. The puzzle piece implies that autistic people have something wrong with them or “missing” in their brains or functioning. In protest of the puzzle piece symbol being used for autism, autistic self-advocates have used sayings such as, “People, not puzzles,” “I am not a missing piece,” and a common saying in the disability community, “Nothing about us without us,” as the puzzle piece symbol was made without the involvement of autistic people. 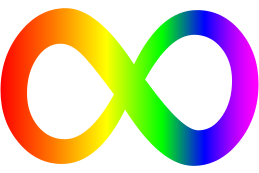 More autism-positive symbols, including the rainbow infinity loop for neurodiversity, was made by autistic advocates such as Judy Singer, who coined the neurodiversity term and promoted the social model of disability at a time when even less was publicly known about the needs of autistic people. So, what should we do with the puzzle piece symbol? Some autistic people may choose to repurpose or reclaim the puzzle piece symbol to have a more positive meaning about the interconnectedness of the autistic community. A majority of autistic self-advocates choose to scrap the symbol altogether due to its extensive ableist history, and this is what I choose to do myself. No matter how I try to change the puzzle piece into something more positive for autism, I have to acknowledge that its history has been tainted by large autism organizations run by nondisabled, neurotypical people that claim to speak for autistic people. I think that no matter what, organizations should seek the opinions of autistic people before neurotypical autism “experts” on matters that affect them, such as the imagery and symbols they decide to use to represent an entire marginalized group of people. If you want to use a more positive symbol for autism in April or any month of the year, use the symbol for autism acceptance rather than awareness, or that of neurodiversity (the rainbow infinity loop, or the gold infinity loop for autism acceptance). The color gold is another positive color for autism rather than blue. The color blue is used by Autism Speaks to promote the idea that autism is primarily for boys and is the color of their puzzle piece logo. The color gold is from the periodic element “Au” which is shorthand for autism, and some autistic people choose to go “gold” for autism instead of participating in Autism Speaks’ “Light it Up Blue” campaign. Other autistic people may choose the color red or participate in the campaign #RedInstead as red is an opposing color of blue used by Autism Speaks, and red is used as a color to support acceptance for autistic individuals. Some autistic people use crimson gold, combining the red and gold colors used for autism acceptance. To support and properly represent autistic people, ask them first what language, symbols, and terminology they prefer before asking neurotypical people. Be aware of how symbols can support ableist notions, such as characterizing autism as something that needs to be treated or “cured.” And the next time you see a puzzle piece for autism, remember its ableist history to prevent it from being used in an ableist manner. Wonderful article! I will be sharing with everyone. Thank you very much for the feedback and for sharing this article! And thank you for correcting my grammatical error as well, I will update it in the article. solution…don’t support at all. not worth the backlash. done. Why the puzzle piece is a huge no to the vast majority of #ActuallyAutistic people, including me. Louder for those in the back! Thank you so much for the reblog! I’m going to check out your blog as well! Thank you for reading and reblogging my article, it really means a lot! Last year, at 77 years old, i was diagnosed with High Functioning Autism. I had never seen a yellow one in my whole life, but a few days later, whilst gardening, I found one on my arm………It took me a minute, but then I realised……. MOST ladybugs are typically RED with black spots. I’ve always loved yellow and call it my ‘happy colour’. Aww that’s a great observation. I love ladybugs myself. Yellow Ladybugs is an Australian charity advocating for and supporting girls with autism. You’re spot on about the ladybug analogy. The History of symbology in the Autism universe should be no secret for anyone who’s involved in Autism Advocacy. Thank you! I like using the crimson gold colors as well. Beautifully said! And I love that you have a neurodiversity infinity sign tattoo! Thank you for this!!! Is it ok if I hyperlink your article in my first blog text? I mention the puzzle piece and some friends didn’t know what i meant. Of course! Thanks for reading and sharing my article! Thank you for writing this article. I appreciate that it is informative, but also respectful and non-judgement. I wrote a similar message last year. I will be sharing your article on my Facebook blog page, too. Thank you for your feedback and for sharing this article! Where can we find the infinity symbol? Thank you for sharing! Much appreciated! Really good piece! I know I’m being a picky academic, but I wish you’d cited a few of your sources, especially about the group in the UK, if for no other reason than people might wish to do additional research. Thank you for the feedback! I’ll go back through the article and add citations. Thank you for the insightful article. A suggestion: I would encourage changing the language to people-centered language, ie. people with autism, instead of autistic people. I am ok with puzzle pieces (but I am parent of Autistic) but I am not OK with Autism Speaks or their campaign. I think there are much more important topics to do with the lack of Canadian supports for those who have HF ASD falling off the support cliff… than if a puzzle piece is a good symbol or not for Autism. If we could put as much energy there as we do here… maybe this might be a more important topic.